Ingredients: Extracted from raw Macadamia nuts, blended with soy and palm oil for extra creaminess and spread. No Preservatives. MACADAMIA BUTTER DELAYS CELLULAR AGING. 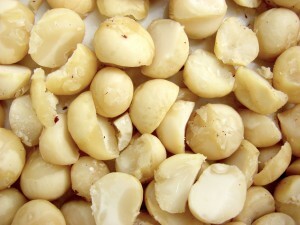 Macadamia Nut Body Butter is regenerative, and has been successfully used to speed healing of scars. As we age, our skin contains lessened amounts of Palmitoleic acid, which is responsible for delaying cell aging. Macadamia nut butter replenishes the skin with Palmitoleic acid (Omega 7). Omega 3 and Omega 6 fatty acids in this butter, promote youthful, soft, and supple skin. ♥ It is considered very safe to use on the face, AND IT DOES NOT LEAVE A GREASY FILM. Instead, a satiny finish will give your face a youthful glow. This makes it a top anti-aging face cream, which is preservative free. ♥ If you have dry, brittle hair or rough cuticles, rub Macadamia nut butter onto the affected areas regularly. ♥ Use this Macadamia Blend Body Butter for massage, if you like an extremely velvety slip.